1. Place the pork mince and black pudding in a bowl and mix together until fully combined. Take a length of foil, place on a chopping board and generously grease with butter. Spread the black pudding and mince mix on the foil in a rectangle, then top with the pork loin. Roll to make a sausage with the loin running through the middle. Twist the ends of the foil tightly so the sausage is very firm and has no air in it. 2. Bring a pan of water to a simmer, then add in the pork. Reduce to a medium heat, and cook for 1 hour and 15 minutes. Remove the cooked pork from the water and transfer into an iced water bath to cool. 3. While the pork is cooking, make the pastry. Place the plain flour and a pinch of salt in a bowl. Heat the dripping and 100ml water in a pan and bring to the boil. Meanwhile, make a well in the centre of the flour, pour in the hot dripping mixture and mix using a spatula, until fully combined. Wrap with clingfilm and leave in the fridge to rest for about 30 minutes. 4. Remove the cooked pork from the foil and pat dry with some kitchen roll. Roll the pastry out into a rectangle about 23x28cm and just a couple of mm thick. Place the pork on top and wrap in the pastry sealing the edges with a little water. Pinch the pastry closed at the ends. 5. Heat a pan of vegetable oil to 180ºC. Carefully place in the Wellington. Cook for 8-10 minutes, turning halfway through. 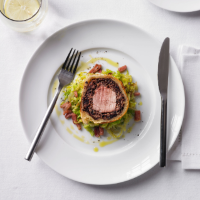 Lift the Wellington out of the oil on to a plate lined with kitchen paper. Rest for 15 minutes. 6. Meanwhile, make the cabbage. Place a large pan of water onto a high heat and prepare an ice bath. Blanch the cabbage for 1 minute in seasoned, boiling water. Refresh in the iced water. Drain thoroughly and squeeze the cabbage dry. Sauté the lardons in a large non-stick frying pan with the oil for 4-5 minutes until golden. Add the shallots and cook together until the shallots are softened, about 3-4 minutes. Return the Savoy cabbage to the pan, add the butter and cook for 1 minute. Season to taste. Then trim the ends of the Wellington and carve into slices. Serve with the cabbage. Alternatively, to oven bake, preheat the oven to 200ºC, gas mark 6. Roll the pork and black pudding sausage in oiled foil and roast for 45 minutes, cool. Wrap with pastry and cook the Wellington for 30 minutes until golden.